Original LP listed on Stereophile's Record To Die For list. One of the greatest bluesmen ever. His harp, vocals, and songwriting have never been surpassed. All his records are classics, but this one is truly unique - it's the cream of two rare, acoustic albums cut in Denmark in 1963. Gentle, personal blues with brilliant harmonica, accompanied by only Matt 'Guitar' Murphy and Memphis Slim on piano. When 'Willie' Rice Miller, aka Sonny Boy Williamson, made these intimate, casual recordings in 1963, he was already (probably) 66 years old. Most of his long career was over; only two years later he would die in his little apartment in Helena, Arkansas. He was recognized as a giant throughout the blues world as a harmonica player, vocalist, songwriter, prolific recording artist, live performer and wildly colorful personality. 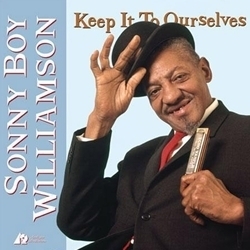 "Starting in 1951 and continuing into the '60s, Sonny Boy made some of the most influential blues records of all time; Help Me,, Nine Below Zero, Mighty Long Time, One Way Out, Don't Start Me Talking, Keep It To Yourself, Bring It On Home, and dozens more.